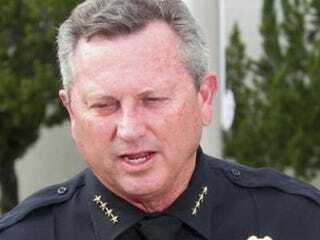 A Florida man has been charged with threatening former Sanford Police Chief Bill Lee, according to the Associated Press. Lee, who temporarily stepped down amid outrage over the shooting death of 17-year-old unarmed teenager Trayvon Martin, received emails this past Friday saying that he and his family should be killed. Police say that they have arrested and charged John Carnduff Stewart. Stewart lives in Melbourne, 70 miles south of Sanford. Stewart reportedly sent an email to Lee with the subject line, "Coming after you." He signed the email with his name, address and phone number, according to Black Voices. "Stewart admitted to sending the email to Chief Lee," Heather Smith, a spokeswoman with the sheriff's office, told Black Voices. Stewart has been placed on electronic monitoring as a condition of his $10,000 bond. Lee resigned during a press conference on Thursday, saying, "I am aware that my role as the head of the department has become a distraction," and that "I have come to the decision to temporarily remove myself."